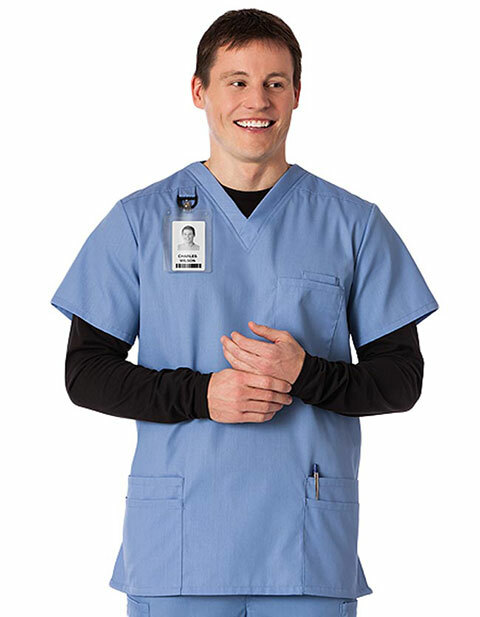 White Swan Fundamentals Contrast Inside Neck Facing Nine Pocket Openings - 1 Breast Pocket with Pen Stitch and 1 Additional Alcohol Wipe Pocket, 2 Double Lower Patch Pockets with Divided Stitch Line on Outer Pocket - 1 Hidden Cell Pocket.Side Slits. Plastic D-Ring on Forward Shoulder For Badge Clip Box Pleat on Back Yoke for Added Comfort and Movement. Center back length: 31 inches.